These components do more than just provide a comfortable and enjoyable ride - they work together to help keep your car or truck handling securely. A properly maintained steering wheel and system keeps you in control of your vehicle while the suspension system, including your shock absorbers or struts, coil springs and linkage, help support your vehicle's weight and help keep your tires in contact with the road for better traction. Stop in to Orr Automotive and have of certified technicians take a look. You can also make an appointment online. 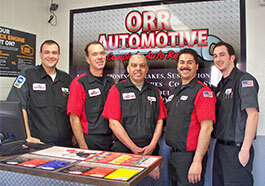 Orr Automotive services Montclair and the surrounding areas.